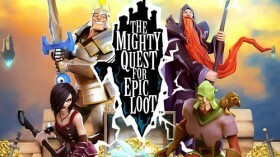 I have followed and played the game Mighty Quest For Epic Loot by Ubisoft for a few years now. I first started playing it in Closed Beta, then I had a break and came back when it was in Open Beta. I have probably spent thousands of hours playing this game and have always been a huge fan. The game has big potential, but due to many issues with the organization around the game development, Ubisoft has always struggled with an ever decreasing player base and an angry community. Since 2 months back the development of the game has come to a complete stop and no updates are being made anymore. With many people in my professional network, I came to learn that the Lead Director of the game has quit and moved to another project. Along with that, the rest of the development team went under an internal performance review which resulted in relocation and/or termination of some or all of the team. My sources also informs me that there is no budget set for further development of the game. This means that even though it has not yet been announced, the game will very likely be shut down or just left to be as it is. Meanwhile all this was happening, I have been working closely together with 3 very successful virtual entrepreneurs who are specializing in online gaming and virtual investments. I approached them with the concept of the game and some ideas on how to make it better and also very profitable. For a few weeks we talked back and forth about ideas around the game and how it could be improved and how the new business model would work. The 24th of August 2015, we mailed Ubisoft’s chairman and CEO Yves Guillemot and explained that we are interested in a partnership and to buy 51% of the ownership and rights to the game. On the 29th of August 2015 we updated Yves with our offer of €750,000 for 51% of the rights and ownership to the game, and also included a rough draft of our terms on the partnership, which we left open for negotiation. We explained that our offer stands until the 11th of September 2015. As of today, the offer has expired, and we have not heard a single word from Ubisoft’s Yves Guillemot. ← Rolex gold watches is a waste of money!